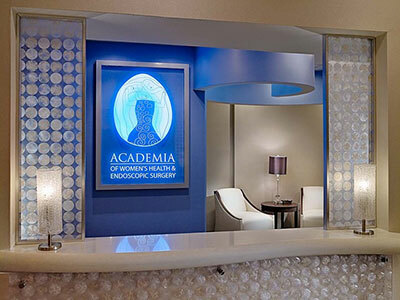 Academia of Women’s Health & Endoscopic Surgery is a women’s health and gynecology center conveniently located in Atlanta, Georgia. Seeing patients from ages 11 to over 100, we serve the needs of our patients through every life stage with care and attention. 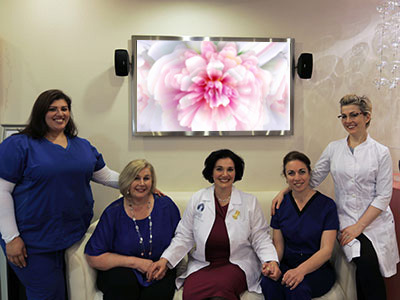 Patients of Dr. Assia Stepanian are surrounded by an atmosphere of love, compassion, serenity, and confidence. We welcome patients with open arms and look forward to being able to provide you with the care you need in the manner you so much deserve. Academia was founded by Dr. Assia Stepanian in 2011 with the mission of serving the needs of women with full consideration of their current and future health by taking into account the patients’ medical conditions, cultural beliefs, immediate and ultimate life goals, and genetic predispositions. Specializing in minimally invasive surgery techniques, we seek to provide the highest level of care with a patient-centered approach founded on mutual trust and communication, with continual follow up and support. 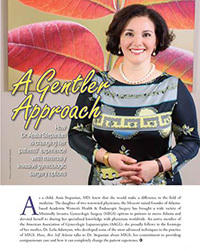 Dr. Assia Stepanian has long been devoted to the propagation of the most effective techniques in women’s health and gynecologic surgery. Dr. Assia Stepanian grew up in Moscow, the daughter of two illustrious physicians. 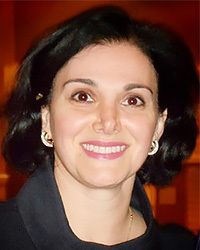 In fact, much of her training was supervised by her mother, Professor Leila Adamyan, the developer of some of the most advanced techniques and classifications used today in the practice of Minimally Invasive Gynecologic Surgery. Dr. Stepanian received her medical degree at the world-famous I. M. Sechenov Moscow Medical Academy in 1992 and completed her OB-GYN residency at the Russian Academy of Medical Sciences Center for Perinatology, Obstetrics, and Gynecology in 1994. In her desire to share the advanced techniques she mastered, she moved to the United States and completed an OB-GYN residency at East Carolina University’s Brody School of Medicine in 2005. Wishing to expand her knowledge, she completed the American Association of Gynecologic Laparoscopists (AAGL)/SRS fellowship in Minimally Invasive Gynecologic Surgery from 2005 to 2007 under the mentorship of Dr. Thomas Lyons, pioneer of Laparoscopic Supracervical Hysterectomy and other techniques. Dr. Stepanian received additional training in urogynecology and pelvic floor reconstruction with Drs. John Miklos and Rob Moore, innovators in Pelvic Floor Reconstructive Procedures, from 2005 through 2007. She significantly benefited from her courses with Professor Arnaud Wattiez in the laparoscopic treatment of Endometriosis which took place in Strasbourg France. Through her work with SurgeryU, both as a founder and mentor, she has helped to educate over 11,000 doctors from around the world. She also teaches at the meetings, writes, mentors and enjoys working with her colleagues in Atlanta as well as internationally. In 2007, she joined Dr. Thomas Lyons at the Center for Women’s Care and Reproductive Surgery and has been caring for women in Atlanta ever since. 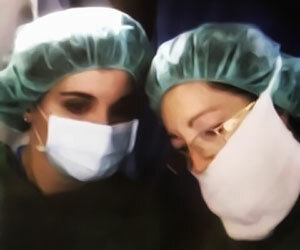 She founded Academia of Women’s Health and Endoscopic Surgery in December of 2011. Women come to see Dr. Stepanian in Atlanta locally, from different states, and even countries for annual evaluations and management of problems. Dr. Stepanian is quite candid about her devotion to her patients. "My focus is always on learning about the total woman. I spend a great deal of time talking with each patient, and I find that I am both teacher and student. It can be a deeply fulfilling experience for us both. Our visits invariably end with a very warm and gratifying hug. I am extremely fortunate." 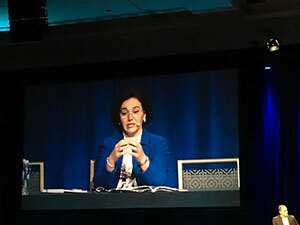 Dr. Assia Stepanian is a Founder and Editor-in-Chief of the online media and educational platform of the AAGL (American Association of Gynecologic Laparoscopists), SurgeryU. SurgeryU includes the world’s largest and first collective online video-library in minimally invasive gynecologic surgery and involves an outstanding faculty and engages members of AAGL. The mission of SurgeryU is to enhance the professional and educational exchange between professionals and organizations interested in developments in Minimally Invasive Gynecologic Surgery (MIGS) by providing multimedia educational opportunities. Under the leadership of Dr. Stepanian, SurgeryU has become a catalyst for international medical cooperation on multiple levels. Collaborations were formed with Global Library of Women’s Health, Journal of Minimally Invasive Gynecology, and OBGYN.News. Seventy-two affiliated organizations have been invited to participate in educational opportunities of SurgeryU; over 11,000 surgeons from over 110 countries visited the live web events of SurgeryU. Lectures and video materials of international meetings were streamed live. At a national level, education opportunities at SurgeryU became free for all of the OBGYN residents in the US, enhancing their educational training in various aspects of MIGS. As a result of Dr. Stepanian’s active work with the AAGL (American Association of Gynecologic Laparoscopists) staff and SurgeryU Editorial Board, over the short period of one time, SurgeryU expanded its two libraries to stream over 2,000 videos presented by the members of AAGL and SurgeryU faculty, enhanced the process of video material peer review and submission, started the Live Surgical Events that allow monthly viewing of the live surgical events over the 40,000 servers worldwide, formed SurgeryU Collaboratives to enhance subject specific exchange of knowledge at AAGL, created an opportunity for all members to introduce themselves through their portfolio; and gave manufacturing companies a collaborative venue for teaching members how to use their equipment and material most safely, efficaciously, and effectively. Dr. Stepanian has also served as a member of the Board of Trustees of AAGL, the Bylaws Committee, the Advisory Committee of AAGL, Editorial Advisory Board of the Journal of Minimally Invasive Gynecology, the chair of SurgeryU Editorial Board, the Editor-in-Chief of SurgeryU, and a member of the CME, Resident and Fellows, Scientific Poster, Website, and Video committees of the American Association of Gynecologic Laparoscopists. She has been a member of AAGL since 1995. 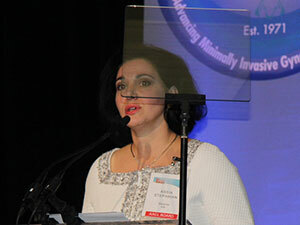 Dr. Assia Stepanian received her medical degree in Moscow at the I.M. Sechenov Medical Academy in 1992. She completed an OB-GYN residency at the Russian Academy of Medical Sciences Center for Perinatology, Obstetrics, and Gynecology in 1994. She has been involved in multiple research projects both in Russian and in the United States, and in 2005 completed an OB-GYN residency at East Carolina University’s Brody School of Medicine in the US. She was rewarded and completed an AAGL/SRS Fellowship in Gynecologic Endoscopy. Dr. Assia Stepanian is the author or coauthor of articles in both Russian and American Medical Journals on the topics of Pelvic Floor Reconstruction, Laparoscopic Hysterectomy, abnormal uterine bleeding, fluorescence in gynecology, and sterilization procedures. Her presentations at international meetings have also addressed a wide range of subjects such as minimally invasive options for treatment of uterine fibroids, endometriosis, genitourinary malformations, robotic surgery, and various suturing techniques. She has been trained by her mother, Professor Leila Adamyan, the developer of techniques in the treatment of various types of gynecologic pathology, including Endometriosis, Adenomyosis, genitourinary malformations, vaginal agenesis, MRKH. An advocate for patient-doctor interaction who follows the excellent clinical traditions of her family, she formed Academia of Women’s Health and Endoscopic Surgery in Atlanta, where is is currently in private practice. Dr. Stepanian received additional training in urogynecology and pelvic floor reconstruction with Drs. John Miklos and Rob Moore, innovators in Pelvic Floor Reconstructive Procedures, from 2005 through 2007. She has benefited very much from her courses with Professor Arnaud Wattiez at Strasbourg, France in surgical management of Endometriosis. Through the years , she has continued to be involved and contributes to the research and developments in team of Professor Adamyan and the Russian Kulakov center in research and developments in reproductive health and surgery from which she has received her Professorship. In recognition of her contribution to education and research, she received an honorary professorship from the Russian Federal Center for Perinatology, Obstetrics, and Gynecology, a facility of superior care, named after the innovative V.I. Kulakov, to which Dr. Stepanian has remained professionally committed. Dr. Stepanian has been actively involved in leading and organizing the Annual Congresses in Russia in Reproductive Health as well as the Congresses in Innovations in MIGS since 1991, the conferences that draw over 900 attendees annually, including world-renowned international faculty, featuring the most updated knowledge in all fields of reproductive health including MIGS, endometriosis, contraception, menopause, menstrual disorders, pelvic pain, reproductive concerns, and many other areas. Click here to read her resume. Academia staff has been handpicked for their knowledge, work ethic and care for our patients. Dr. Stepanian is thankful to the teams of talented specialists who contribute their superb skill and devotion in allowing us to serve our patients while accepting multiple insurance plans. 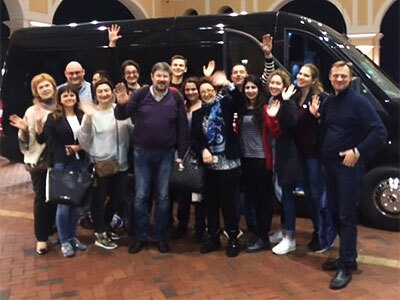 Our International Team arriving to the annual Global AAGL meeting in Las Vegas, NV for lectures and presentations.